Helloooooooooooooo how you're doing? Have you had a great and warm weekend? The weather is getting warmer, snow and ice are starting to thaw and the roads are much better. And today is my Stampin'Up! Birthday I AM 2 YEARS OLD !!!! Gosh it is hard to believe really so much had happened since I first joined. For a trip down memory lane here s my first post as an Independent Stampin'Up! Demonstrator. When I sent for my Starter Kit I never imagined that two years down the road my life would have changed so much, I am walking a wonderful road enriched by all the wonderful people I have met through Stampin'UP! my customers, my Passionettes the many wonderful demonstrators, it truly is the best thing I have ever done and I am grateful for it all . 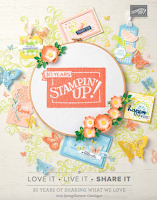 I love my life as a Stampin'Up Demonstrator ! And because is my birthday I have PRESENTS and CAKE and some PRIZES UP FOR GRABS !!! I took the colour combo from my new look blog. I do love colour and I am very much into Teal, Turquoise and Pinks right now. I don't think I need to tell you how much I love this Medallion background Stamp, I think it has to be my all time favourite stamp ever made and I mean EVER. It is just fabulous. Here you go!! Happy Moments SAB stamp set which is available to earn FREE until the end of February 2010, Bella Toile background Basic Gray, Real Red and Certainly Celery is the colour combo, and I made a HUGE cake by stamping the image twice then cutting down the layers, I only added colour to the tiny flowers using markers . Buttons are pretty ones form the Latte Collection and *GASP* No ribbon on this card !!! I think by the time I added the Happy Birthday banner it looked finished to me. Now of course I want to say thank you so very much to each and every one of that visits me and give you the chance to WIN a little prize. You will receive A Little Bit of Happiness, a gorgeous stamp set this was one of last year's Level 1 hostess sets and no longer available, A Regal Rose ink pad, a pack of glue dots I love glue dots and I always use them to secure ribbon, buttons etc. to my cards, and some beautiful crochet flowers along with some yummy filigree brads. What do you need to do to be in with a chance? well just leave me a comment and tell me which card you prefer from the two. You don't have to link to my blog or follow me unless you wish to, but I know bloggers like to share those candy opportunity with their friends, so do tell your friends . Happy birthday MOnica... I wish you more and more hapiness for the following of your SU'story !!! I prefer the first card which are my colours too. Which reminds me I must go and order a lovely pink bag from Kipling that I saw on QVC last night. I like your cake card but I have to say my favourite is definitely the presents card as I think the colours are absolutely fab. I love the your first card, with the presents on it, which girl doesn't like pink and CHOCOLATE!!! 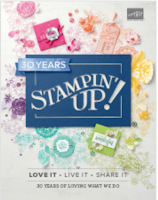 Happy 2nd Stampin' Up Birthday! My fav is the second card, using the grey background - these are more my colours, (turquoise is def not a fav colour) - but both are great. Happy 2nd Birthday Monica may you have many many more. Both cards are fab as usual but I simply love the first card, the colour combi is yummy. My favourite card has to be the present one, my fave colour combo ever!!! Thanks for the chance to win some lovely candy! Happy 2nd birthday Monica, gosh to choose a card is hard, but I think the first one just pips it, I can see the medalion stamp going into my next order. wishing you many many more SU Birthdays to come. I think my fav has to be the first with presis love how the pink just pops out. Firstly congrats on your 2nd Su Birthday, very well done indeedy!! I love love love them both though my fave is the taken with teal one, as the medallion stamp is mine all time fave too, its so elegant!! The colour scheme of the card is to die for!!! Be happy about it and celebrate! Love your new blog design. White background (!) and fresh colors. I like the cake card the best but I do look at your blog often for ideas Keep up the good work. Yummy prizes, haven't got this set! Congratulations hun x You're a super demo with a huge future ahead of you. I look forward to seeing your creations each time you post. All the very best. Happy SU birthday! My favourite is the cake card, both background stamps are just fabulous but I really love the elegance and colour combo of this card. Hi Monica, Congratulations on your 2 years!!! Happy birthday, Monica. I love them both but think I will have to go for the cake one as the colours are so unusual. Happy 2nd birthday Monica. Keep up the good work. I like the second one personally because anything with green in it gets my vote. I love the crisp contrasts and the way the mat just pops from the background. 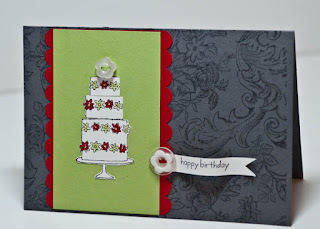 Happy Stampin Up Birthday Monica. I really like the colours of your 1st card. Thanks for all your inspiration I love your blog. Many happies Monica. I like the first card because I too love teal and pink together. But I also love what you did with the cake stamp -clever you. Congrats Monica. Both cards are lovely but Cake just wins by a nose!!! Probably because I'm not really a pink girl. My favourite card is the first one , lovely colour combo. Thanku for chance to win the fab candy. happy b irthday to you, happy irthday to you, happy birthday dearest monica, happy birthday to you! i cant believe you've only been doing this for two years - you've achieved so much in that little time! Wow you have achieved so much in two years! Have a very Happy SU Birthday, you deserve it! Love the pressies card best, the colours are devine, might just have to copy them for a project myself! I love the first card best Monica, pink, turquoise and chocolate chip rocks! I also love pink, turquoise and purple as well. SU definitely makes the best colours ever! Happy 2nd SU Birthday Monica, I love both cards the first for the yummy colours but I think I love the cake one best, could just eat a piece! Happy 2nd SU Bithday Monica, I loved both cards, the first for the yummy colour but I think I like the cake one best I could just eat a piece! Hi there Monica and congratulations on your Stampin Up! birthday! I prefer the cake card but TBH I like them both - I wish i could make cards like you do!! I absolutely adore the colour combination on the presents card - I like this one the best. Happy Birthday Monica. I prefer the second card as I really like the background on it. Both cards are gorgeous, but I have to say that the pink and turquoise one is my favorite. The colours are really gorgeous. Happy Bday SU!! I miss being a SU demonstrator :( Your doing fantastic and it's nice to watch you grow. I like the 1st card the best. The colour combo is fantastic. The background stamp also reminds me of a snowflake. I totally love snow and have enjoyed the snow, but still want more. Great job on both as it was a hard choice! The present card gets my vote- I love the MEdallion Stamp too. Hi Monica I've just found your website and would like to wish you a happy stampin'up birthday. I love your card with the presents, they're my fav colours as well. Congratulations Monica, I love both cards but my favourite is the first. I'm sure there will be many more SU birthdays. Love your new look. Happy birthday! Love the cake card, but maybe thats because I love cake! I like the first card best - the colours are awesome! My favourite card has to be the first one! I just love the striking colour combo and the way you have tied the ribbon with the pearl! It looks so effective! But the second card is lovely too! Thanks a lot for the chance of winning! I forgot to mention which was my fave card the first time I posted so I've deleted and re-posted! I love the elegance of the 2nd card but the colour combo of the first card makes that one my favourite! 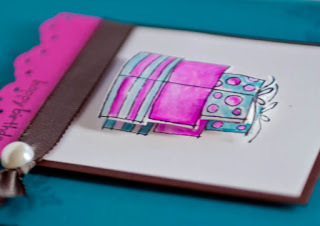 Congrats on hitting your 2nd anniversary and thanks for so many inspiring cards & projects! Happy SU Birthday Monica, you really are inspiring to us all. Love the cake card best. It has to be the present catd. Love, love the colours! Out of the two beautiful cards.. Have to say, Number 2 hit's it for me. Love the dark dark myself.. so classy! Congratulations on your 2 year anniversary Monica. I have to say the first card has to be my favourite. I love the bright colours and the 3D effect.